Turkey season is upon us, and for me, that means sweet potato season! I love sweet potato in pretty much any form -- baked, fried, pie'd -- but in this gratin form, it is savory-sweet bliss at its finest. I first discovered this recipe years ago at a potluck in Brooklyn (thanks, Heidi, for sharing). I've since made it every Thanksgiving. It is the perfect sweet potato side dish for your table. Yes, this means your aunt can stop bringing those awful candied yams with marshmallows on top. Ickk. The prep is the most tedious part of this dish, but it can be made a breeze if you have a good mandolin or food processor with a slicing attachment. If you are going the old fashioned knife route, I find it easier to nuke the potato just a minute or so to soften it before attempting to cut into thin slices. Don't worry if your slices are not perfect, they will be covered with delicious crunchy topping anyway. Back to the savory-sweet bliss part. If you're always walking the line between salty and sweet, meet in the middle au gratin, and come with a big serving spoon. The earthy sweetness of the potato anchors this dish, while savory sweet onions add an aromatic dimension. The thyme complements the sweet potato well without overpowering it with herby-ness. Heavy cream and butter make this a holiday dish (don't skimp, it's worth it). 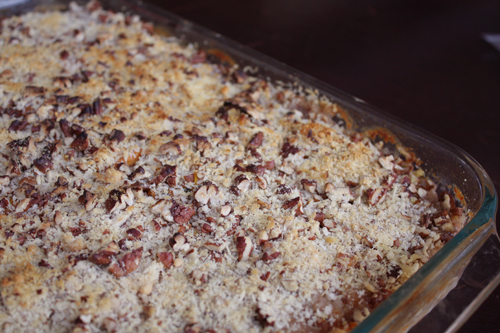 And, the topping, mmm…extra crunchiness from the panko offsets the soft texture of the gratin, Parmigiano brings even more buttery, savory, goodness into the picture, and pecans top it all off with toasted nuttiness, tinged with a sweet maple flavor. Make this dish ahead of time to save on holiday stress. Simply prepare it up to the topping part. That way, come meal time, all you have to do is sprinkle the topping, drizzle with olive oil, and pop it in the oven until heated through and golden on top. Leaves you more time to figure out what to do with Aunt Ro's marshmallows. 1. Heat the oven to 350°F and arrange a rack in the middle. Butter a 13-by-9-inch baking dish and set aside. 2. Melt butter in a medium frying pan over medium-low heat. When it foams, add onion and season well with salt and pepper. Slowly cook until soft and translucent (about 30 minutes); set aside. 3. 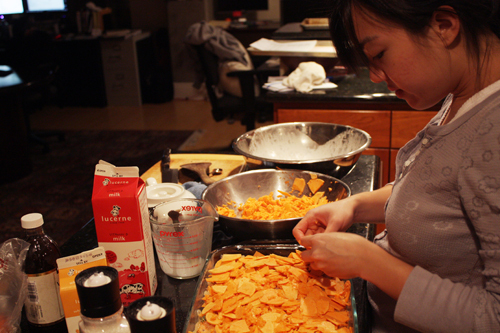 Peel sweet potatoes and cut into 1/8" slices with a mandolin, sharp knife, or food processor with slicer attachment. 4. Mix the cream, cayenne and thyme leaves in a large bowl and set aside. 5. In the baking dish, layer 1/3 potato slices on the bottom, 1/3 cream mixture, add salt and pepper, and ½ of the onions. Repeat, layering another 1/3 of potato slices, 1/3 cream mixture, salt and pepper, and the rest of the onions. Finish off with the last of the sweet potato and cream mixture, and a sprinkle of salt and pepper. 6. Cover with foil and bake 40-50 minutes (it should be soft and cooked through). 7. Combine topping ingredients and sprinkle mixture evenly over gratin. Drizzle with a little olive oil to help with the browning. Bake uncovered, about 10 minutes, until golden. Keep an eye out to make sure the pecans don't burn.